As we see comic book blockbuster tentpoles break records, it’s easy to forget that Hollywood was afraid of superheroes for long time. We would get one occasionally, and they were often great (Donner’s ‘Superman’ films, Burton’s ‘Batmans’) which made it all the more odd that we didn’t get more of them. The film industry would occasionally make good, but they would hesitate to greenlight anything comic related. Despite a lack of hero flops, most never got off the ground. James Cameron was attached to Spider-Man for a long time but it fizzled. Tim Burton’s bizarre and massive ‘Superman Lives’ was axed far into pre-production. As a young comic fan, it was a drought and I clung tightly to anything superhero related. As a little boy I obsessed over Disney’s live-action hero spy comedy ‘Condorman.’ It was a silly movie about a cartoonist who becomes the character he draws. I haven’t seen it years. It’s probably terrible. But that’s not the point. It was related to comic books. I would take anything I could get. That included comic-adjacent films. I remember obsessing over ‘Darkman’ and evangelizing to anyone who would listen about how what Sam Raimi could do with a superhero property (nailed it. Good job 12-year-old me.) I suffered for my fandom. I rented the truly awful straight-to-video 1990 ‘Captain America’ multiple times. I saw ‘Blankman.’ In theaters. Opening day. I recorded every episode of the short-lived Fox television show ‘M.A.N.T.I.S.’ about a paraplegic man who gets a robotic suit. I wore out the VHS tape. The idea from Hollywood seemed to be that you couldn’t make a straightforward superhero film. At least not without softening the cartoony edges. Burton’s ‘Batman’ got rid of gray spandex for black armor. ‘X-Men’ traded blue and gold outfits for leather jumpsuits. The first major modern comic book film, ‘Blade,’ did everything it could to hide it’s Marvel roots. Studios seemed to feel more comfortable with superhero comedies like ‘The Meteor Man’ and the wildly successful ‘The Mask.’ For a long time Hollywood didn’t know what to do with superhero properties and created a subgenre of not-quite-comic-book-movies. For better or worse, ‘Shazam!’ feels like one of those. Superhero fatigue has been a consistent threat even as comic book properties continue to break box office records. The jokes are starting to recycle, the CGI-soaked finales are blending together. I will continue to see superhero films until they don’t make them any more. But I get how they’re growing stale. ‘Shazam!’ feels fresh because it takes a different approach. It feels very much like one of those films of my youth. This could very well have been made in the 80s or 90s as a comedy vehicle. Your enjoyment will likely depend on what you are looking for. This does not feature spectacle and city-destroying battles. There are very few explosions. In many ways, ‘Shazam!’ feels small. But it’s also genuinely sweet and surprisingly simple. 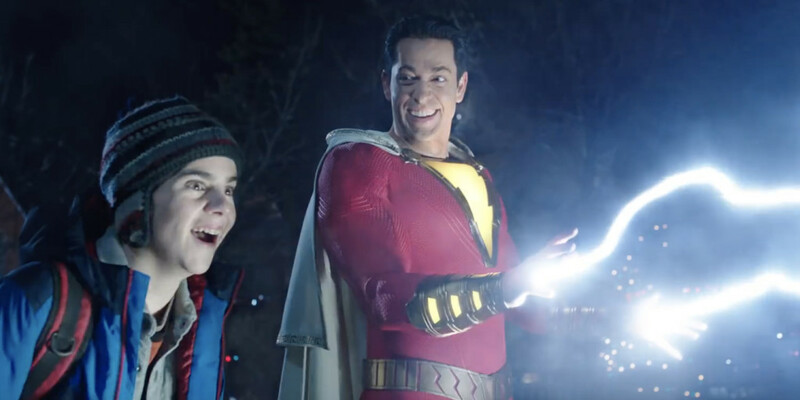 One of my chief complaints about ‘Shazam!’ is one I also have for ‘Big.’ Zachary Levi is fairly charismatic and funny in the lead role, but he doesn’t seem to know how fifteen-year-olds act. Hanks had the same problem in ‘Big.’ The tendency to portray ‘kids in adult bodies’ as infantile is always jarring. This has been true in almost every body switching movie I can think of. A similar 1988 film had Judge Reinhold switching places with his son Fred Savage and playing him as silly and unrealistic. It’s not how kids act. It’s how adults think kids act. 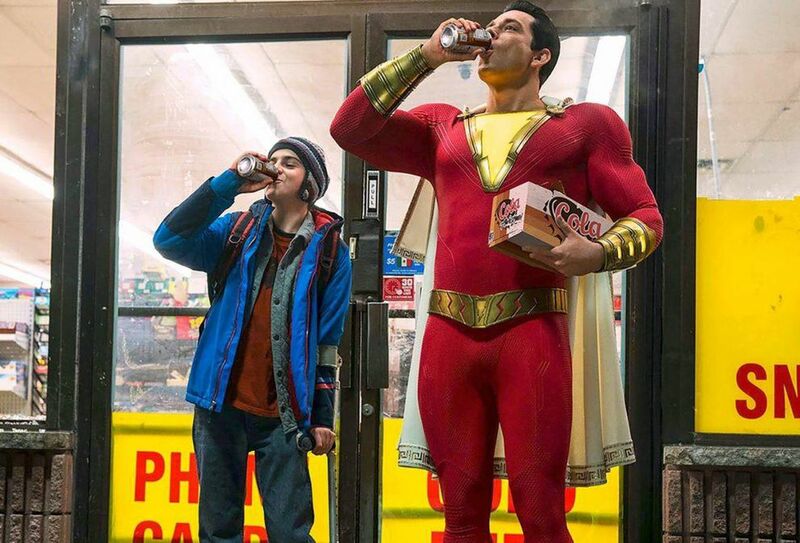 Levi falls into this same trap and it creates a disconnect between his gawky and dumbfounded Shazam and Billy Batson (Asher Angel) who has a resentful chip on his shoulder and a rebellious streak. ‘Shazam!’ is a body switching superhero comedy. Just picture that in your head for a moment. It’s that. An enjoyable experience, but one that packs little surprises. Zachary Levi is fine but unremarkable. The foster parents Rosa and Victor (Marta Milans and Cooper Andrews) are comfortingly warm. The kids are varied and funny. They lack the individual perfection of ‘The Goonies’ which they are referencing, but they’re persistently empathetic. A standout is the atomically adorable Darla (Faithe Herman) the damaged, neurotic and painfully optimistic youngest girl. She may as well be an animated character with giant eyes and it completely works. Stealing the film is Billy’s foster home roomate and sidekick Freddy (Jack Dylan Grazer.) Previously part of the stellar cast of 2017’s ‘It,’ Grazer delivers the film’s best lines as tries to come up with names for his hero friend or helps him become a YouTube sensation. A weak point is the villain who is the forgettable Dr. Thaddeus Sivana. I had to look up that name. I’ve seen the movie twice and I could barely remember anything about him. He doesn’t have an interesting look. His supervillain backstory is so old-hat that it was clichéd fifteen years ago with Syndrome in ‘The Incredibles.’ It also doesn’t help that he is played by Mark Strong who has played the same vanilla villain (vanillain?) in so many movies that they blend together. Director David F. Sandberg is an interesting filmmaker who I’ve followed for years. His short film ‘Lights Out’ is three of the scariest and most exquisitely-paced minutes in horror film history. I was highly disappointed by the full-length feature he did later but that short film remains untouchable. After the by-the-numbers mediocrity of ‘Light’s Out,’ he delivered the better-than-expected ‘Annabelle: Creation.’ ‘Shazam!’ is adequately directed without much flourish but it gets the job done. I’m hoping Sandberg shows more of the promise he displayed with his short films, but with this he seems to be establishing himself as a reliable workman. One of the inarguable high points of ‘Shazam!’ is the magnificent score by Benjamin Wallfisch. Wallfisch has become one of my favorite composers in recent years, creating the tremendous music for ‘It.’ Some of his most interesting work has been his collaborations with Hans Zimmer on both ‘Dunkirk’ and ‘Blade Runner: 2049.’ The score of ‘Shazam!’ is bombastic heroism and soaring trumpets. He is channeling 1980s Horner, Williams and Goldsmith and I am all the way here for it. ‘Shazam!’ is competent, inoffensive family fun. More of a comedy than a superhero film, it is a refreshing change of pace. When other comic movies increasingly feel like long episodes of an endless serial, it is nice to have something this simple. It’s also what DC needs right now. After the messy and often dour beginning of the DC series, it has started getting itself on track. The invigorating success of ‘Wonder Woman’ and the beautiful nonsense of ‘Aquaman’ have earned a lot of goodwill. But ‘Shazam!’ is not interested in attaching itself to a larger universe. You don’t need to do homework before watching this. ‘Shazam!’ works as a standalone film and a breezy family comedy. In today’s superhero landscape, that feels like punk rock.